A classic cheese sauce mix with Cheddar cheese. Cheese powder (Cheddar cheese (MILK) (11%), cheese (MILK), whey powder (MILK)), WHEAT flour, skimmed MILK powder, maltodextrin, palm fat, modified potato starch, salt, sweetcorn powder, spices (MUSTARD seed, turmeric), sugar, yeast extract, anti-caking agent (silicon dioxide), pea starch, flavourings. May contain egg and celery. Stir 160g in 1 litre of boiling water, stir well to mix and simmer for 2 minutes. 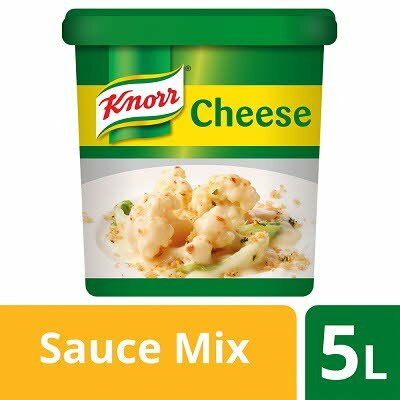 Add 30-60g extra per litre if you require a thicker cheese sauce.